A current, thorough, conversational, and scientifically sound resource on meteorology. A World of Weather: Fundamentals of Meteorology presents basic principles that enable students to gain a “thorough possession” of the underlying scientific principles of meteorology and to be able to think critically about them. This text shows how fundamental concepts fit together to form a conceptual pyramid that explains how the atmosphere really works. It shows students how to apply the concepts learned by offering examples based on real weather data. designed for lifelong learning – students are given the design, tools, and building blocks to construct their own pyramid of learning. written in a conversational style – this encourages students to engage in the material. hands-on – students experience real weather data through the NEW online component. common unit conversion formulas and a description of Metric (SI) orders of magnitude. information on building and interpreting the station model. Weather Folklore and Commentary in many chapters. Focus on Optics sections that expose students to the colorful wonders of the sky. Electronic Resources housed on a monitored website. Reflects recent weather events, including a nor’easter in January 2016, California’s wet winter 2016-2017, El Niño, Hurricane Harvey, and more! Introduces the Regional Snowfall Index (RSI), a relatively new technique to rank snowstorms regionally according to their societal impacts. Features an introduction to dual polarization radar, a relatively new tool in a weather forecaster’s toolbox. Includes considerable updates to the chapter titled Human Impact on Weather and Climate (i.e. climate change). Now has online assessments and online learning and teaching resources for students and instructors. It features more than 100 new laboratory and interactive exercises! Jon M. Nese is Associate Head for Undergraduate Programs in the Department of Meteorology and Atmospheric Science at Penn State where he teaches a variety of undergraduate courses, including Introduction to Weather Analysis and Synoptic Meteorology Laboratory. He also hosts the Emmy Award-winning series WxYz for the department’s long-running weather magazine show Weather World. Prior to joining the Penn State faculty, Dr. Nese was an on-air Storm Analyst for The Weather Channel and Chief Meteorologist at The Franklin Institute Science Museum in Philadelphia. While there, he co-authored The Philadelphia Area Weather Book, which received the 2005 Louis J. Battan Author’s Award from the American Meteorological Society. Lee M. Grenci retired from the Department of Meteorology and Atmospheric Science at Penn State in 2012 after 28 years of teaching. From 1986 to 2001, he was also a member of the Penn State Weather Communications Group, whose responsibilities included the daily preparation of the weather page for the New York Times. Among many honors, he received the Wilson Award for Outstanding Teaching in Penn State’s College of Earth and Mineral Sciences in 1993, the College’s 2003 Mitchell Award for Innovative Teaching, and the College’s 2008 Faculty Mentoring Award. In retirement, Lee is active in raising money to help people afflicted by multiple sclerosis. He has raised over $32,000 for research to find a cure for MS. He is also an avid cyclist. David M. Babb prepared much of the artwork within the text as well as the digital media used in many of the exercises. Dr. Babb received his B.S. in meteorology from the University of Kansas, during which time he worked summers at the National Severe Storms Laboratory in Norman, OK. In 1996, he earned his Ph.D. from Penn State studying cloud-drop sizes using millimeter-wave radar. Currently, he teaches several online meteorology courses and resides as a fellow in the John A. Dutton e-Education Institute at Penn State specializing in instructional media design and assessment. His use of media and interactive learning tools for a nationally acclaimed online forecasting course at Penn State has been honored by the University Continuing Education Association. "The text itself is wonderfully thorough, and I love the fact that it doesn't just spit forth facts but explains the concepts by which things work. The recent case studies and examples are great, as I've found students relate better to current events. I truly believe it is a text that gives the non-meteorologist a real grasp of the complexities that make Lee's, Jon's, and my jobs so difficult. I am actually structuring the course around the text as the material is presented in such a logical manner." 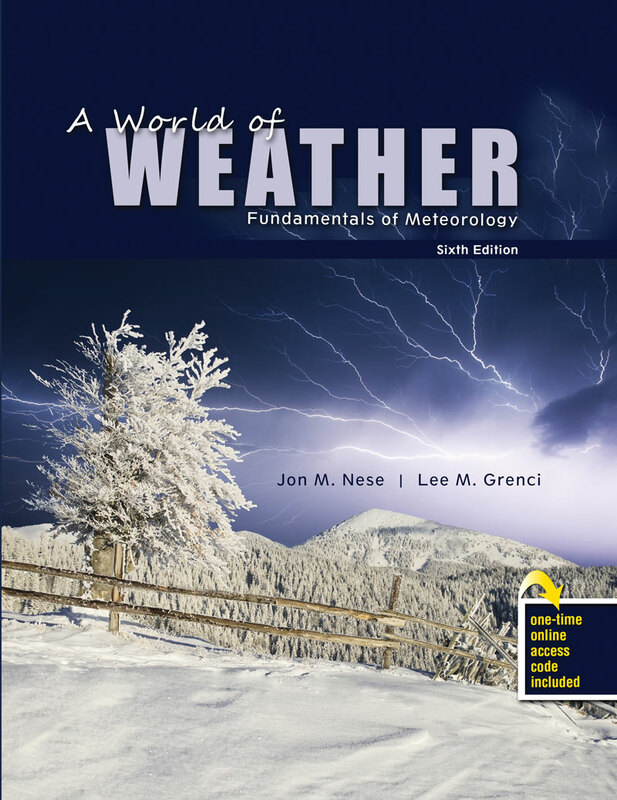 "Nese-Grenci A World of Weather: Fundamentals of Meteorology is the absolute best text out there for a four credit course which includes a lab and/or real-time weather forecasting such as mine." "It's a great text because it gets all the science across in a clear/enjoyable manner for students with no background in meteorology." "The new edition is great and I have used it for several years. Funny, scientifically solid, just a very well-done book. Kudos."